To access the advanced XML editor, it is necessary to select an xml request, and click on the Advanced XML editor button. Flat XML allows editing the XML text. 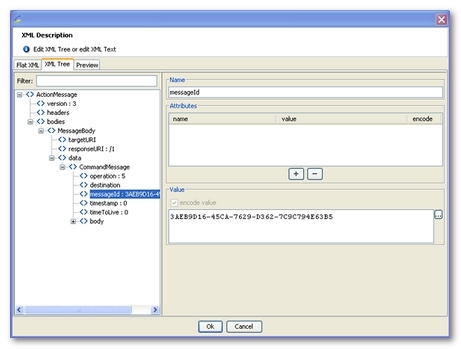 XML Tree is used to edit the nodes of the XML tree using the open tree view. The variable picker in this view makes it especially useful when using variables. If a node value contains a variable, and this variable is already encoded, the option not to encode it XML-wise is available. In this case, NeoLoad adds the attribute NeoLoad-encode="false" to the corresponding node, visible in the Flat XML tab. This additional attribute is deleted during the XML encoding phase of the test and is not sent to the server. Preview provides a read-only preview of the body of the request to be sent. The variables are interpreted and the carriage returns deleted. The Apply button must be clicked to save any changes made to the request.